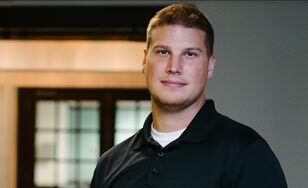 As a husband, new father, National Guard soldier, basketball coach and full-time math teacher (personal variance), St. Scholastica Elementary Education student Brandon Greenwaldt has a unique path. But it's not stopping him from completing his undergraduate degree. "Last semester I took 16 credits, taught every hour of the day with no prep period, coached high school basketball and was still able to get a 3.95 GPA," Greenwaldt said. "On weeks where I had drill, I'd work at school Monday through Friday, travel for drill, then start a new week without a break." What's more, Greenwaldt and his wife Mallory have adopted three children in the past three years — two siblings and an 11-month-old boy. He says that while it's been a great transition, he's had to be even more disciplined to ensure he stays on track. With a life filled to the brim with responsibilities, Greenwaldt needed a program that was flexible enough to accommodate his needs. St. Scholastica was the answer. "No other program would allow me to keep teaching full-time while taking classes," said Greenwaldt who has received a personal variance from his school district to continue teaching while earning his degree. "What helps are the time frames the classes meet, which are Tuesdays, then every-other Thursday. On class nights, I leave from work and head to the St. Paul campus." According to Greenwaldt, it's not just the program structure that creates an amenable situation — it's the people, from the students in this cohort to the professors. "Here, we're on a first-name basis with everyone, we share stories, and we even bring in food all the time," he said. "We've gotten pretty close." According to Greenwaldt, the hybrid online and on-campus class design works well, and requires students to immediately apply what they've read, viewed or discussed online in the form of crafting lesson plans. "The lessons we prepare are taught by the students and recorded, then analyzed by our professors and peers," he said. "The in-class portion of our program revolves around the pedagogy of the different disciplines." Greenwaldt plans to support his wife in her educational endeavors as well. In fact, there's a deal in place. "My wife decided to take time off from her social work career until the kids are in school full time, but the deal was that if we did this, she'd go to grad school when I finish up in the spring of 2017," he said. Greenwaldt is hopeful about landing any teaching job he wants in the future — in no small part because of the network he's built and the support he's received. "St. Scholastica is way different than any other school I've gone to. The professors are genuinely interested in your development and care a lot about your personal interests and overall success," he said.